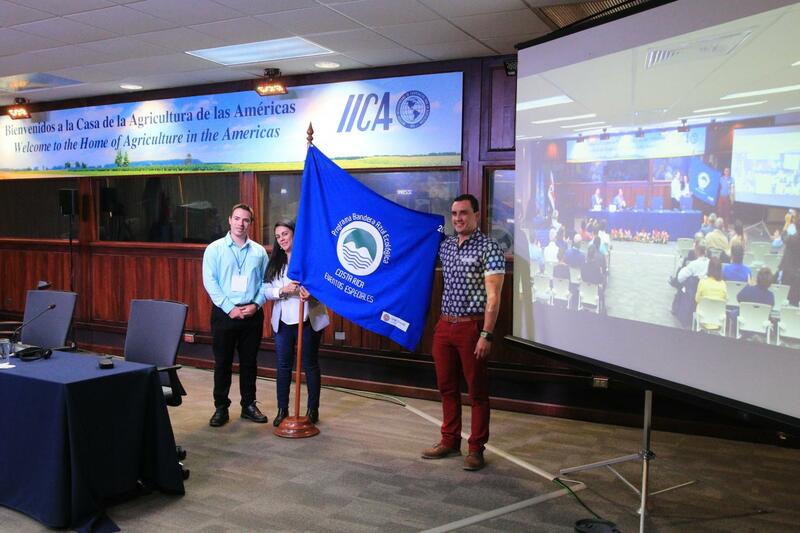 The UN Sustainable Food Systems Program event, which was held at the headquarters of the Inter-American Institute for Cooperation on Agriculture (IICA), received the Ecological Blue Flag (BAE) award in the special events category. San Jose, 8 February 2019 (IICA). The II Global Conference of the Sustainable Food Systems Program of the United Nations (UN) One Planet Network, which was held at the headquarters of the Inter-American Institute for Cooperation on Agriculture (IICA), received the Ecological Blue Flag (BAE) award under the special events category. The event implemented a methodology aimed at avoiding and reducing waste, preventing illnesses and utilizing natural resources in an efficient manner, for which it received a perfect score. The accolade was presented by the Ecological Blue Flag Program of the Government of Costa Rica, after evaluating the event’s compliance with parameters related to environmentally-friendly practices; food waste prevention and reduction; waste management; and the adequate implementation of sanitary measures, among other aspects. During the three-day conference, about 10 kilograms of food were salvaged, food losses did not exceed 5%, and, at certain times, no food was left over. In the very few cases of surplus food, the food was salvaged; the event organizers ensured the food’s safety and subsequently redistributed it to people who could take advantage of it. More than 150 participants received training in environmental sustainability practices. The initiative was promoted by the Costa Rican Network for Food Loss and Waste Reduction of the Technological Institute of Costa Rica (TEC). The academic institution formed part of the BAE Committee along with the Ministry of Agriculture and Livestock (MAG), IICA, the National University of Costa Rica (UNA), the Food and Agriculture Organization of the United Nations (FAO) and Proyecto Plato Lleno (“Full Plate Project”). “This attests to the level of awareness among participants and the manner in which events can successfully prevent food waste through adequate planning, nutritious food and awareness raising among guests. The initiative involved the event organizers and participants in its efforts to foster respect for the environment, public health and food,” explained Laura Brenes, professor and researcher at the School of Agribusiness of TEC. The organization of the event excelled in a number of areas, including the promotion of food safety practices, potable water consumption and proper hand washing; safety and response in the case of emergencies; separation and recovery of waste; and mitigation of emissions. “Working together with various entities in planning, developing and carrying out this event represents a magnificent achievement for IICA. It is very gratifying to have generated a positive impact for the benefit of the environment, and to have raised awareness among conference participants and Institute staff at Headquarters regarding issues promoted by BAE,” added engineer Ronald Meneses, who forms part of IICA’s Blue Flag Committee. The II Global Conference of the Sustainable Food Systems Program of the United Nations (UN) One Planet Network was held from February 5 to 7 in Costa Rica. The event sought to drive increased political commitment to achieve sustainable food systems through a systemic approach that involves various stakeholders and interested parties. In order to pursue the award, IICA, MAG, TEC and UNA jointly assumed the commitment to carry out reforestation and awareness-raising efforts together with the community of the municipality of Coronado. Hosting this activity forms part of IICA’s strategy to achieve the Blue Flag award under the eco-diplomacy category. This process began in February 2018 and is expected to culminate with the delivery of the award in March. Laura Meza, Principal Officer of Resilience and Management of Agricultural Risks at IICA.